The new octo-pal arrived in late January. The polls are in, and the people have spoken when it comes to the National Zoo's new giant Pacific octopus -- hereby known as Octavius. Because we will always, always trust the Internet to decide things. The ocotpus (a.k.a. Enteroctopus dofleini, but then, you knew that, didn't you?) arrived at the Zoo in January, and online polls had been asking users to vote on one of four possible choices for a name. Octavius received more than 4,000 of the 7,000 votes, with Olympus and Ceph tied in second place. Vancouver struggled in a distant last place. Zoo staff believe he's male, but they wouldn't know officially until he gets a bit older. Octavius weighs three pounds at two and a half years old -- and he'll grow to be more than 13 times that within the next year. 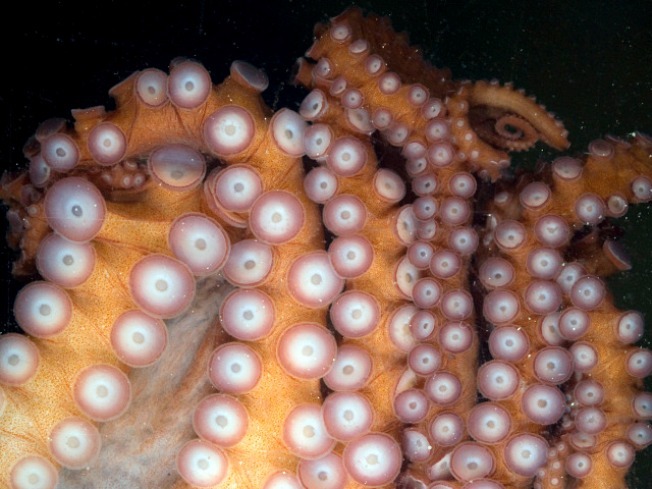 Giant Pacific octopuses hatch from eggs just a bit larger than a grain of rice, but as adults in the wild, they can weigh hundreds of pounds. We're sure Octavius will grow quite nicely. After all, he lives in the District, where he can easily bulk up on half-smokes and cupcakes. You can follow the octopus' growth spurt and enrichment activities on the octopus cam, or by hoofing it down the hill to the Invertebrates' House.